Sergei Doulatov uses stem cell biology and gene editing to explore many facets of blood cell formation. 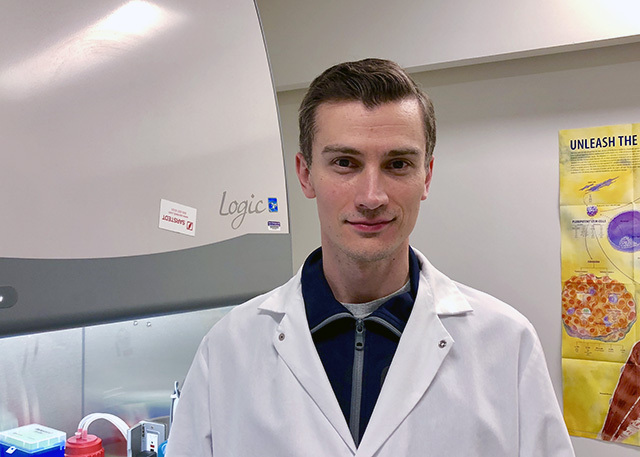 The National Institutes of Health today announced that stem cell biologist Sergei Doulatov, assistant professor of medicine, Division of Hematology, at the University of Washington School of Medicine will receive an NIH Director’s New Innovator Award. The award is part of the NIH’s High Risk, High Reward Research Program which allocates funding to support unusually inventive research by scientists in the early stages of their careers. Please see the NIH news release and the profiles of the NIH Common Fund 2018 New Innovators. Doulatov is an investigator at the Institute for Stem Cell and Regenerative Medicine, where he uses advanced cell engineering and gene editing techniques to learn how human blood cell development is regulated. In addition to advancing knowledge about healthy blood formation, Doulatov’s research has important implications for several medical areas. One of his goals is to reprogram different human cell types so that they can turn into blood-forming stem cells. Such an approach could eventually allow people who require a bone marrow transplant to get one from their own cells. This would eliminate the need to seek a matching bone marrow donor, and might reduce the risk of severe graft versus host disease. A description of his NIH New Investigator project to pave the way for patient-specific bone marrow transplant cells is available in the NIH RePORT database. Doulatov is also looking at how stem cell biology goes awry in some blood disorders, such as bone marrow failure and myelodysplastic syndromes. His lab is developing pluripotent stem cells from patients with these disorders to examine the underlying causes. There have been no new drugs for myelodysplastic syndromes in the past decade. These lab-grown patient cells could offer an efficient way to discover and test possible therapies. In other efforts, his lab is attempting to generate transfusable red blood cells from induced pluripotent stem cells. It is also exploring the mechanisms and changes that contribute to age-related blood disorders. Red blood cells, which transport oxygen to tissues and remove carbon dioxide, and macrophages, the clean-up crews. Credit: Doulatov lab. In earlier work his group found a potentially therapeutic molecule that can turn on a damage-control pathway that recycles worn-out cellular components. Doulatov earned his B.S. degree in microbiology from the University of California Los Angeles. He completed his Ph.D. in molecular genetics at the University of Toronto. He then held a postdoctoral fellowship at Boston Children’s Hospital and Harvard Medical School before joining the faculty at the UW School of Medicine two years ago. He has received grant awards from the National Heart Lung and Blood Institute at the National Institutes of Health, the Evans MDS Foundation, the Tietze Foundation, the American Federation of Aging Research, and the Safeway Early Career Award in Cancer Research.